The 'Boris for Britain' homepage. Our Future Our Choice has set up a satirical leadership bid for Boris Johnson with the slogan “Boris for Britain”. The website includes a letter supposedly from Mr Johnson putting forward his leadership bid. It said: “I never wanted to be Prime Minister. Indeed, if there was anything I could do to stop myself from running for leader, I would. “But we need a leader who will escape the shackles of the customs union, bin the backstop, and push our horizons back out across the seas we once ruled. 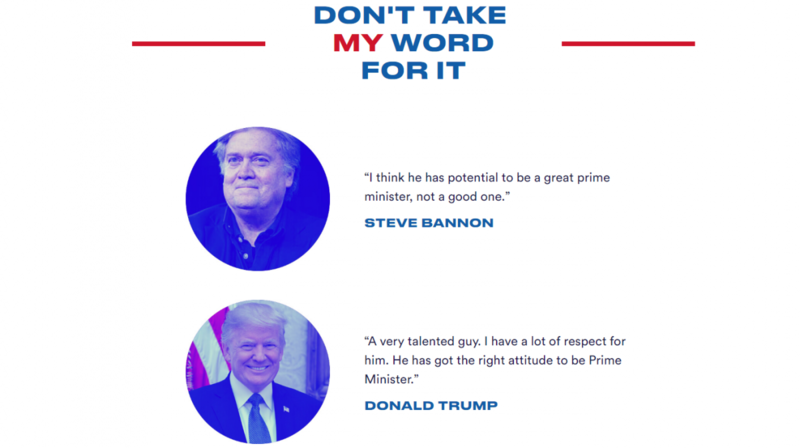 The website includes fake endorsement from figures such as Jacob Rees-Mogg, Nigel Farage, and former Trump strategist Steve Bannon. Visitors to the website are encouraged to donate to the campaign but when clicking on the link; they are instead directed to the crowdfunding page for the anti-Brexit group. A spokesman for OFOC said that they did not think Boris Johnson should be prime minister, but wanted to use the website “to remind the public of his plans”. “Whatever is agreed between Theresa May and Jeremy Corbyn, Boris Johnson is waiting in the wings to rip it up and do his own deal - one that won't include a customs union, or the alignment on worker's rights, or environmental protections,” he said. ““We wanted to remind MPs and the public of his plans, his views, and his friends. That's why we launched Boris for Britain. “Of course we don't actually want him as PM - we want a People's vote on whatever deal is agreed. Mr Johnson has been contacted for comment.